The late A.C.B. Building, Flinders Street West, was renovated and on Friday 29th March 1935 was re-opened as the Palais Royal by the then manager of the Wintergarden Theatre, Mr. W.H.Lock. The grand opening of the new Palais Royal as Townsville’s most beautiful and modern dansant will take place tonight. It is said by southern dancing experts that this dansant is one of the largest floors in Queensland and has been specially prepared by a southern expert. The hall has been renovated on modern ball room style and will be officially opened by Mr. W. H. Lock, popular manager of the Wintergarden Theatre. The special attraction is Mr. Jack Polini and his delightful Palais Royal dance band of seven brilliant musicians. It is Mr. Polini’s intention of making his band one of the most outstanding bands in Queensland. Miss P. Carberry and Mr C. Walduck, the promoters, assure dancers of a wonderful night’s entertainment. Reserved tables are 6d extra and the price of admission is 3/- supper included, which is in the capable hands of Mrs Carberry. For reservations ring 716. 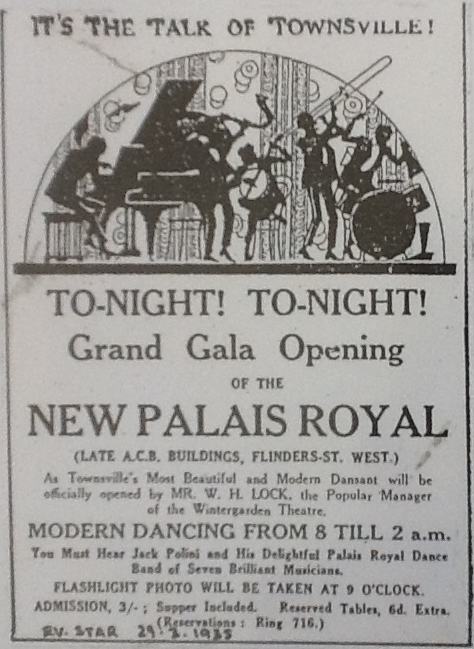 It is with great pleasure that the management of the new Palais Royal, Flinders Street West, announce the grand gala opening night as to-morrow (Friday). 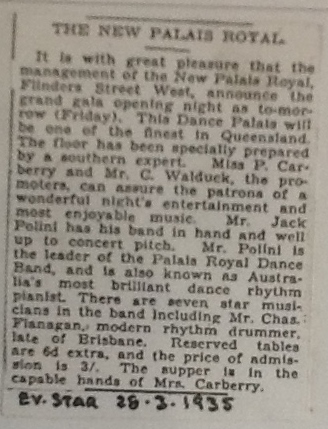 This Dance Palais will be one of the finest in Queensland. The floor has been specially prepared by a southern expert. Miss P. Carberry and Mr C. Walduck, the promoters, assure dancers of a wonderful night’s entertainment and most enjoyable music. Mr. Jack Polini has his band in hand and well up to concert pitch. Mr. Polini is the leader of the Palais Royal Dance Band, and is also known as Australia’s most brilliant dance rhythm pianist. There are seven star musicians in the band including Mr. Chas. Flanagan, modern rhythm drummer, late of Brisbane. Reserved tables are 6d extra and the price of admission is 3/-. The supper is in the capable hands of Mrs Carberry. 1935 2nd Oct, Hermit Park State School grand children’s fancy dress ball. 1935 3rd Oct, welcome to J. Sandy Robertson (Qld & Aust. amateur dance champion) Gala Masked Carnival Ball with Vic. Krosch and his Palais Royal Dance Band of Seven Star Musicians including Mr. Carl Hansen. 1935 5th Oct, Grand Old Time Dance tonight with J. Sandy Robertson demonstrating “The Gladiola”, Sydney and Brisbane’s most popular old time dancer. 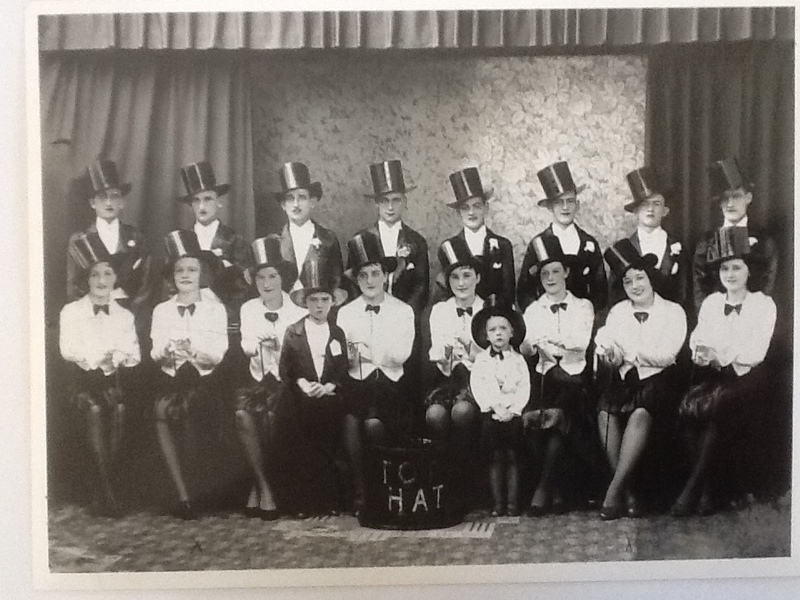 1935 9th Oct, Grand Cabaret on Friday in aid of TOC H funds with Adagio Dancing – Miss Carmen Blackburn and Mr Frank Woolston. Ballet – Miss M. Ballard and her Northern Wonders. Top Row L to R: Mick Hendley, Merv. Hendley, Clon. "Duke" Hendley, Daniel Donohue, Fred Christenssen, T. Farrell, Henry Dennis. Girls: Joyce Farrell, Dot Hendley, Joyce Blake, Alma Hattinson, Claire Farrell, Olive Marsh, Lenore Hendley, Evelyn Arena. Children: Brian & Ailsa Kelliher. 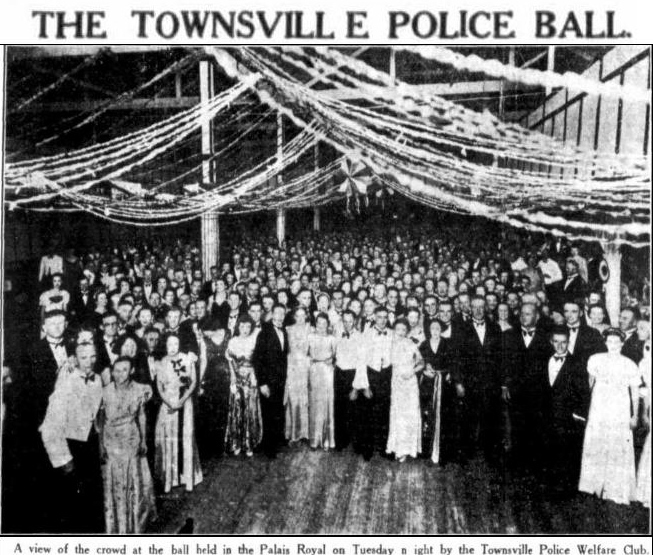 Palais Royal interior decorated for the Townsville Police Welfare Debutante Ball.